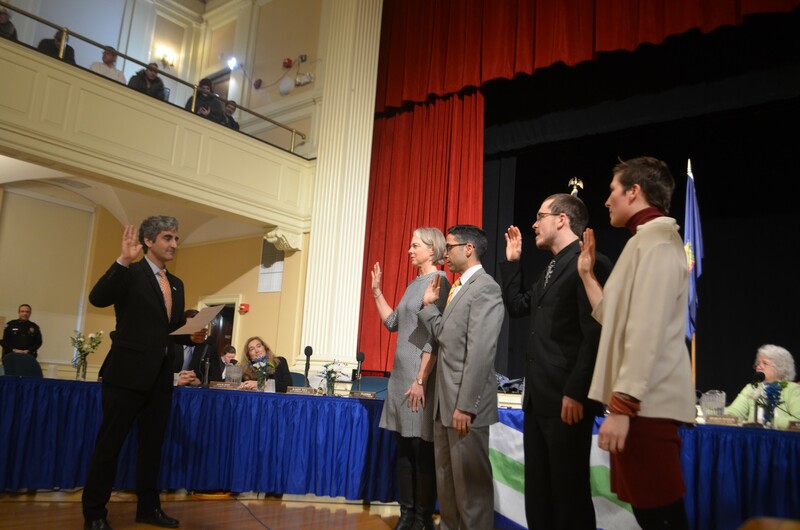 During his State of the City speech Monday, Mayor Miro Weinberger appeared to extend an olive branch to the Progressive Party by outlining a left-leaning agenda addressing climate change and the local housing crunch. Those were both priorities espoused on the campaign trail by Perri Freeman (P-Central District) and Jack Hanson (P-East District), the two young political novices who ousted incumbents Jane Knodell and Richard Deane on Town Meeting Day. With one fewer member of his own party on the council, Weinberger, a Democrat, also emphasized collaboration in city government during the annual address at City Hall. The mayor, who's starting his eighth year at the city's helm, vowed to double down on climate change by introducing e-bikes and e-scooters and adding bike lanes. In the coming year, he said, the Burlington Electric Department would release a road map toward achieving the city's 2030 net zero energy goal. "It is, perhaps, the most ambitious climate goal of any city in America," the mayor said to applause. Weinberger also said that his office would hold a summit in May to review housing policies and priorities and then enact them, pointing to the city's low 1.5 percent vacancy rate. He also said he’d continue to encourage more housing development, both market-rate and affordable. “Let us resolve together that 2019 will be the year we accomplish the structural fixes needed to make housing for all a reality,” he said. The mayor also reverted back to his bread and butter: fiscal responsibility. He noted the city's achievement in finalizing the sale of Burlington Telecom to Schurz Communications last month. In his speech, Weinberger proposed using a portion of the $7 million in sale proceeds to eliminate the 1.5 percent property tax increase that voters approved on Town Meeting Day. He also proposed using some of the cash to replace the city’s fleet of sidewalk plows. He touted the city's efforts addressing the opioid epidemic — and said the work is not yet finished. Starting on Tuesday, social workers at the police department would begin screening arrestees for addiction and offering those addicted immediate access to treatment, Weinberger said. Also on Monday, the council elected Kurt Wright (R-Ward 4) to a second term as the body's president. Wright, too, emphasized a willingness to work across the aisle, and praised Weinberger's plan to avoid raising the property tax. "I'm really pleased," he said. "I think it shows trust in voters, that we said ... that we wouldn't call that money up if we didn't have to." He was less enthusiastic about the mayor's plans to replace parking spaces with bike lanes. "I part with him very strongly on that," Wright said. After the speech, Councilor Brian Pine (P-Ward 3) told Seven Days that he was optimistic after hearing Weinberger's proposals for the year ahead. "I think the mayor took the results of the election and tried to use the State of the City comments to reflect the temperament and the mood of the public, and assure people that he shares those priorities," he said. "I'll take him at his word and at face value," Pine noted, adding that "obviously the details may be where we disagree." Weinberger began the meeting by swearing in the three new councilors that were elected in March: Freeman, Hanson, and Franklin Paulino (D-North District). They replace Knodell, Deane and Dave Hartnett, respectively. Incumbent Joan Shannon (D-South District) also took the oath of office.